Roadhouse coconut cream pie recipe was recommended by my friend KAnn who adapted it from The Harry’s Roadhouse Cookbook. 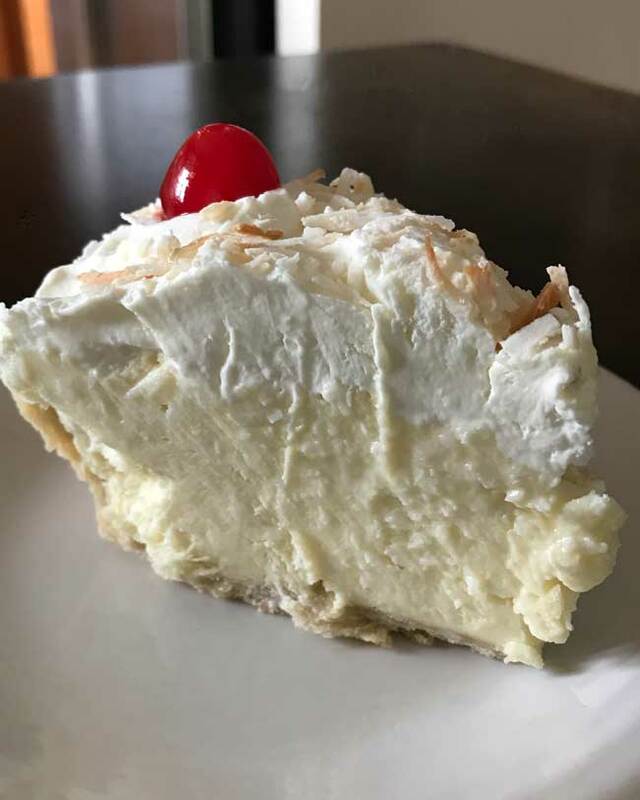 It’s very similar to Richard Sax’s Claremont Diner coconut cream pie, which is a lighter textured cream pie with a filling stiff enough to pile above the shell. You can make it in a 9 inch pie dish with a homemade crust or halve it and put the filling in a smaller dish. The first time I made it I halved the filling and blind baked it in a Marinex 7-Inch Fluted Small Round Pie Pan lined with a baked crust from Cook’s Illutrated. Since then I’ve always made it as a 9 inch deep dish pie. The filling has gelatin, cornstarch and egg yolks in it so it’s thick enough that you can pile it in the shell. It’s also not overly stiff, which is good considering all the thickeners! Over the years I’ve tested with different kinds of coconut and think that sweetened flaked coconut works the best. If for whatever reason you have to use unsweetened, make sure to add more sugar to taste and leave out the salt or add only a pinch. I also use more whipping cream than the original recipe. In the original recipe 1 cup of whipped cream is folded into the pie. I follow this step, but then I whip more cream and spread it over the top. Update: Another option is making the full batch and freezing it, which is what I usually do these days. Coconut pie freezes very, very, well. Put 1/2 cup of milk in a mixing bowl and sprinkle in the gelatin. Allow it to soften. Stir egg, egg yolks, cornstarch, and sugar into the milk mixture. Put remaining 2 1/2 cups of milk in a non-reactive saucepan over high heat to scald the milk. When milk is scalded, gradually whisk it into the gelatin mixture. Pour the mixture back into the saucepan and return to the stove, whisking all the time. When the mixture begins to boil and thicken, remove from heat and add butter, vanilla, salt, and coconut. Whisk until all the butter is melted and incorporated. Place custard in a container to cool. Cover with plastic wrap against the custard to keep a skin from forming. Alternatively, place custard in an 8 inch square pan and put it in a larger pan with ice water coming up the sides. This will help it cool quicker. When the custard is cool, whip 1 cup of cream until peaks start to form, then fold into the chilled custard until smooth. Try not to overmix. Pour mixture into prebaked crust and chill for several hours or until very cold. Sprinkle top with coconut. If desired (and I always do this), whip another 1/2 to 1 cup of cream, sweetened to taste with powdered sugar, add a little vanilla and spread over the top of the pie. If you like frozen whipped topping you can thaw out some Cool Whip and use that instead. Sprinkle more toasted coconut over the pie. ** The original version calls for 1/2 teaspoon of salt, so feel free to add more if you think you need it. I think it's fine with just a pinch. Also, sweetened coconut works best, but if for some reason all you have is unsweetened you can use unsweetened and add an extra tablespoon of sugar to taste. I think sweetened works best, though. The original recipe uses 1 cup heavy cream. After I whipped up the first 1 cup of cream, I whipped up a second ½ cup of cream, added a little powdered sugar and spread it over the top. Now I can hardly wait to get into Santa Fe on May 19th and head to lunch at Harry’s Roadhouse on Saturday! Best coconut cream pie ever!! Yum, this pie is like a big slice of summer :). 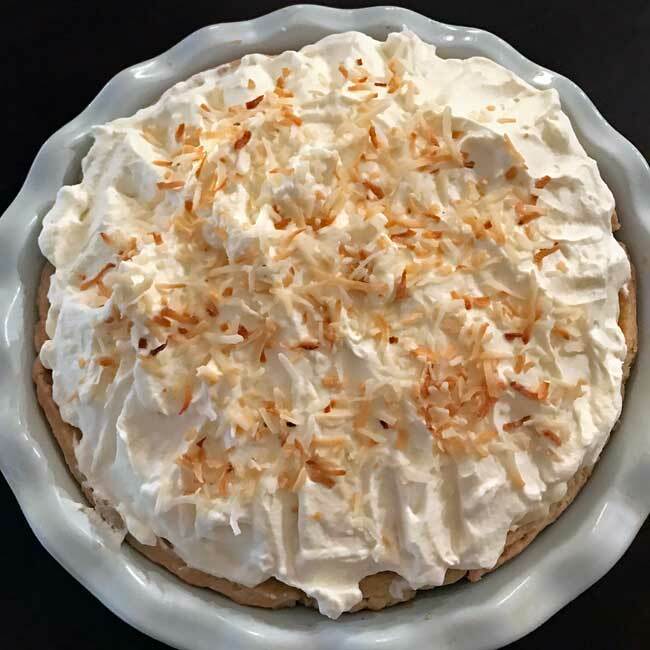 Coconut cream pie is one of my absolute favorite desserts. This one looks great! I will have to remember it. Todd’s favorite is definitely the White Chocolate Coconut Pie. He almost cried when it was gone. This one is a tad bit lighter, so I prefer this one. However, for more of a splurge the White Chocolate Coconut Pie is probably the best. Your white chocolate coconut cream pie was HANDS DOWN the best dessert I made in the last year. If this is even close to that good, I’ll have to make it asap! Anna, of the coconut cream pies you’ve made, do you have a favorite? Your photo is lovely and brings back memories of pies like that when I was young. I can look at that photo and feel the texture in my mouth.. velvety sweetness. 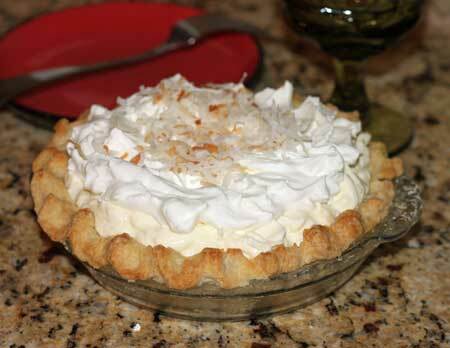 Every time you post a recipe for coconut pie I feel guilty that I never make one for my husband. I meant “too” lazy. I was even too lazy to type the extra “o”! This is a decadent pie! All that cream and coconut! My mouth is watering! I have the worst time with prebaked pie crusts…I’ve used pillsbury ( to lazy to make my own) and they always shrink. I like a slightly savory crust with a sweet pie so I don’t want to use graham crackers. Do you have any tips to prevent the shrinking? How did you like it compared to others you’ve made? And, final question: could you use coconut milk as a substitute for some of the milk? I just noticed some on sale at our local grocery store Byerlys.